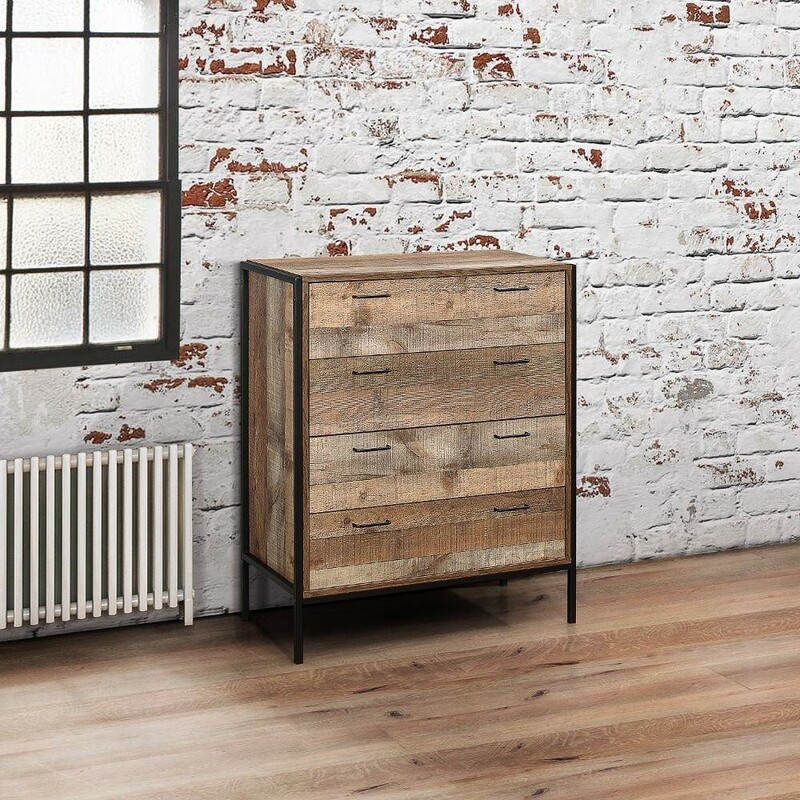 Introduce Industrial chic to your bedroom with the Urban 4 Drawer Chest. Constructed from a solid metal frame that's offset perfectly by the wood effect finish of the drawers, it's the perfect addition to any modern home! The Urban 4 Drawer Chest is perfectly suited to contemporary bedrooms and homes, or houses looking to create a New York loft apartment atmosphere. Store away clothes and other belongings while maintaining the industrial style that makes your home your own. The Urban 4 Drawer Chest provides additional storage space, perfect for clothing, bedding or any other items that you'd like hidden from view. These are sturdy drawers, built to last! They provide homes with plenty of space, to avoid clutter from building up and taking over the space. The industrial design of the Urban 4 Drawer Chest does not take away from its practicality. Use the 4 generously sized drawers to expand your bedroom storage. The handsome design of the Urban 4 Drawer Chest means this piece of furniture also works in other rooms in the home; such as the home office, living room or hallway. Complete the industrial vibe of your home by mixing and matching any of the pieces of furniture in our Urban Collection. The Urban 4 Drawer Chest is one of the many pieces of furniture in the industrial style. The combination of the metal frame and wood-effect finish of the straight-lined drawers is the perfect combination for modern homes. Keep the Urban 4 Drawer Chest clean and remove dust by using a soft, dry cloth. The product is part of the Urban Wooden Bedroom Furniture Collection.